Argue against mythicism by means of just one particular argument as if the many opposing viewpoints of their own peers simply do not exist. That is, they must suppress the fact that there are mainstream scholars who do support some particular details found in mythicist arguments. This kind of ‘baggage’ fallacy (often deployed as a variety of the text-book fallacy of “poisoning the well”) is common enough to warrant particular condemnation. In fact, I see this fallacy committed so regularly, so widely, by accomplished scholars who ought to know better, that I feel the need to call particular attention to it now, in the hopes it will forestall a repeat performance. If you cite a scholar as proving point A, and that same scholar also argues B, but B is not necessary to A, then it is a fallacy for anyone to assume you agree with B, and a fallacy to employ this assumption to argue that if B is not credible then A is not credible. I call this the ‘baggage’ fallacy because it amounts to saddling an author with all the ‘baggage’ attached to the scholar he cites or the views he defends, when such attachment is neither entailed nor warranted. Just because I take certain positions or arrive at certain conclusions is no excuse to impute to me all the baggage that is usually supposed to come along with those positions or conclusions. Leap of Faith or Failure of Reason? I was taken aback when I saw that the pingback on my previous post, Miracles and Historical Method, was from the Doctor of Whoville. Since we know McGrath doesn’t read Vridar, somebody must have told him about it. This subject marginally interests me. I’m curious about religions and what people believe, but the ways in which people accommodate ancient superstition with modern reality makes me uncomfortable. Not that there’s anything wrong with accommodation, it’s just that the part of my life where I tried to salvage the good parts of Christianity in light of — well, in light of reality — is over. The mental gymnastics involved just weren’t worth the effort. It felt too much like keeping two sets of ledgers: one set of books with cooked numbers that add up to God and another set that actually make sense. Dr McGrath has a bee in his bonnet about mythicism and says a lot of crazy things about it and anyone who presents an argument for it or (in my own case) even presents an argument that leaves room for it as a valid possibility. This sort of response to my views took me a bit of getting used to and I look back and see there are some things I said or ways I said things that I have come to regret. I think it is important to stand up to Dr McGrath’s fallacies and hold him accountable for his assertions. It is important to have it on record that his claims do not go without a response. But what I would ask is that, even if it is against our clearest judgement and the facts of the evidence before us, that we refrain from giving Dr McGrath the sort of material that he is eagerly looking for from us — that is, insults in kind, abusive remarks, character attacks. He has said, for example, that he cannot post on this blog because people abuse him. Well, I don’t think that was the case at all, nor is it the real reason. Let the records and the evidence speak for themselves. We need do nothing more than argue the case, present the evidence, and let others draw their own conclusions about his character and integrity. The main reason is not so much for the benefit of any exchanges with Dr McGrath — he will never change his spots no matter what. But to me it is important that this blog be seen as a reasonable and professional sounding voice in the debate in the wider community. I don’t, however, reject any good-natured humour or satire. Dr McGrath is not averse to having a laugh at mythicists from time to time and I am sure he is big enough to laugh at his own side of the fence with good natured comedy, too. I know I have said things I regret and cannot make promises for the future. But I’d like to try anyway. And I’m glad that there has been very little personal attack on Dr McGrath on this blog. I’m sure we can keep it that way. 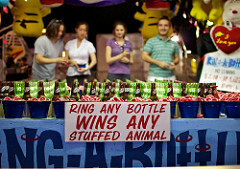 Have you ever gone to the carnival and tried your hand at the ring toss? Ever tried to pop the balloons with a dart, or knock over the milk bottles with a ball? And did you come away suspecting the game was rigged? Well, odds are the game was rigged. In some cases the game operator can tinker with the target, give you a sharper dart or a larger ring – he can let you win whenever it suits him. However, in other cases, you’re never going to win. It looks as if you could win, but it’s impossible. It’s rigged. I am copying Tim’s comment on a recent post here as a post in its own right. Some interesting backpedaling today on Exploring Our Matrix . . .
For me, the strongest support for the Documentary Hypothesis’ distinction between sources based on different ways of referring to God comes from the Psalms, specifically Psalm 14 and Psalm 53. If you read them both side by side, you’ll see that they are both essentially the same psalm, the only major difference being that one addresses God using the divine name YHWH, and the other does not. According to the DH, the community that produced the Elohist tradition believed in YHWH, worshiped YHWH, and called God YHWH. However, they believed that the name “Yahweh” was unknown until it was revealed to Moses. I don’t see any way of accounting plausibly for these two psalms being part of this collection other than in terms of there being different groups, or regions, or kingdoms, which had different preferences regarding how to refer to and address God. And that makes it seem plausible to account for the different passages in the Pentateuch which refer to God in different ways in terms of those same distinct traditions or groups. Again, within the Pentateuch both P and E use Elohim from the Creation until the Burning Bush. So there are great chunks of the patriarchal narrative in which Elohim is used. The group that copied and saved Psalm 53 appears to have changed YHWH to Elohim, but this very likely happened well after the United Monarchy but before the collection of the Ketuvim. The evidence, then, indicates that some particular group at some undefined time preferred to use Elohim liturgically vs. Adonai (YHWH). But this redaction likely occurred in the exilic or post-exilic period, not in the fictional time of Abraham, Isaac, and Jacob. In fact at least one commentator (W.O.E. Oesterley) thinks Psalm 53 comes from the later Greek period. Incidentally, the first commenter on Exploring Our Matrix brought up the Elohistic Psalter. It’s unfortunate that nobody seemed to pick up on that term. Without going too far down the rabbit hole here, it’s interesting to read the different theories on the explanations of the variations in the different collections. But I think we’re far from seeing any kind of consensus that explains all the related phenomena. I’ve only recently come upon Goulder’s books on the Psalms, and they’re really fascinating. What is significant about these two psalms (which are put to notirious [sic] use nowadays by some Christians) is that they provide corroboration external to the Pentateuch for differing traditions which resemble and presumably bear some relation to the traditions that produced and passed on the different Pentateuchal sources. This is the same error as Error 1, but repeated for effect. Even if we were to accept Goulder’s theory that Psalm 53 is older than Psalm 14, it’s the process of textual transmission to a later period that accounts for the change to YHWH. For by the time of Ezra and Nehemiah the use of Yahweh was clearly dominant. I think some may be forgetting that the P source, which is generally dated late, perhaps exilic or postexilic, had a preference for the use of Elohim, i.e. referring to God rather than using the name Yahweh. Edited conclusion and added the last paragraph since first posting this. This is not about mythicism versus the historicity of Jesus. It makes no difference to me if Jesus was a revolutionary or a rabbi, lived 100 b.c.e., 30 c.e. or was philosophical-theological construct. All of that is completely irrelevant for assessing the validity of the fundamentals of how historians [ideally/should] work with sources. From what I have read of mythicist literature I think that few mythicists are any more informed of the basics of how a historian ought to approach sources than are most theologians and other historical Jesus scholars. Theologians have taken the lead in biblical studies and others approaching this field have fallen in step with the methods they have bequeathed. 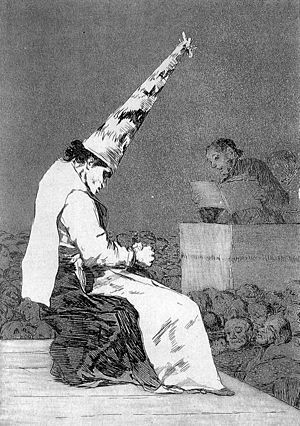 Unfortunately theologians generally have the most to lose ideologically from any change in their methods and so are likely to be the most antagonistic to any criticism of their methods that comes from outside their guild. Not that valid historical methods will necessarily mean the demise of the historicity of Jesus. Far from it! But I do believe that valid historical methods will at least open up the question to potentially greater respectability; they will also make greater intellectual demands on theologians to justify their hypotheses and assumptions. Maybe there lies the great fear. Recently I have posted a few extracts from historians giving basic advice on how historians should approach their sources. “From Reliable Sources” by Howell and Prevenier looks primarily (not exclusively) at written sources and Vansina is an authority on history derived from oral sources. Since I placed these quotations beside those of a theologian who asserts strenuously (though consistently with zero supporting evidence) that theologians do just what other mainstream historians do, I was accused of misrepresenting both the historians’ works I quoted and his own words that I quoted in full. It was even suggested I had not even read the books along with the sly hint that since I was a “lowly librarian” I was not qualified to quote anyone or comment on an academic question anyway. Such are the cerebral (intestinal?) responses from those who reluctantly look into a verbal mirror placed before them by one whose otherwise unrelated conclusions they despise (fear?). The touchstone of all historical interpretation of a source is knowing its provenance. Yet this is the first hurdle historical Jesus scholars crash into. Historical Jesus scholars bypass the basic standards historians normally apply when approaching their sources and rely entirely on circular reasoning to establish what they need to support their hypotheses. Let’s look again at what are the basics any historian worth his or her salt should first establish in order to know how to interpret a document and understand what sort of information can be validly gleaned from it. Two caveats to the above, though. An increasing number of scholars, no doubt theologians among them, are now embracing valid historical methodology in relation to the Old Testament. Further, there are good histories and bad histories, diligent historians and lazy historians. 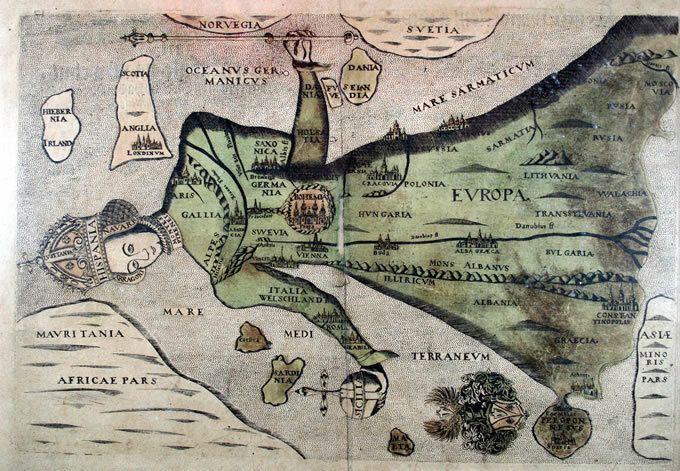 My yardstick in this post for what constitutes good history is taken from works I have discussed in recent posts — an introduction to graduate students about to undertake serious historical research and various editions of an authority on oral history. Recently a theologian helpfully advised me to do a bit of background reading on how historians work generally in order to come to see that historical Jesus scholars do work by the same principles as applied by historians generally. So I did. I shared what I read there about the basics of how historians ought to approach their documents in How Historians Work – Lessons for historical Jesus scholars. The same theologian was even kind enough to subsequently recommend that I read a work by oral historian Jan Vansina in order to understand that historians “adapt” or “refine” standard principles in order to make them fit the special requirements where, say, written sources are very scarce. The point of this exercise was for me to learn that if I see theologians using something not exactly the same as I see in other history books, then I was to understand that if historians do not have a rich abundance of written materials they do indeed “refine” or “adapt” principles so that they can work with that scarcity of evidence. So I did that, too. I chose Jan Vansina’s “Oral Tradition as History” (1985) and his earlier “Oral Tradition: A Study in Historical Methodology”. Before I continue I should say that the idea that any historian “refines” basic methods such as “external attestation” or the need to establish provenance before knowing how to interpret a text for certain types of historical information quite confused me. My own understanding has always been that historians merely limit and change the questions they can ask so that the tried and true tools they use can still be used validly. They don’t “refine” their tools to enable them to get more answers than the sources would otherwise allow. That has certainly been my understanding as a student of both ancient and modern history. From my experience there is nothing different in principle at all — no refinements or adaptations of what are really basic logical “tools” — but only the fact that historians of ancient times can never hope to know the sorts of details about events or people as they can know for the well-documented recent past. But the theologian insisted I was in the wrong and that if I read Vansina I would see that historians do indeed “refine” and “adapt” their methods to fit their “needs”. They are applied differently, he has said. 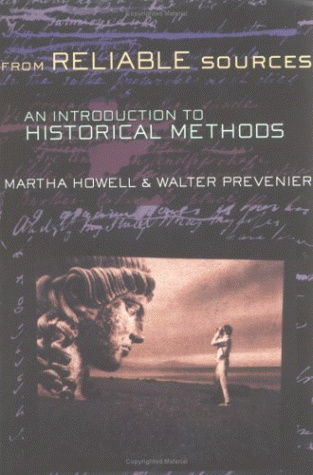 Recently a theologian kindly advised me to do a bit of background reading on how historians work (specifically to read chapter one of From Reliable Sources: An Introduction to Historical Methods by Martha Howell & Walter Prevenier) in order to come to see that historical Jesus scholars do work by the same principles that all other historians generally use. This is the very evidence we lack for historical Jesus studies. But chapter two does indeed address in detail how historians should approach the written sources (in this case “secondary sources”) we do have for Jesus. Unfortunately my theologian advisor had not read chapter two and insisted that it really was chapter one that I needed to read because, he explained, it mentioned “oral traditions”. 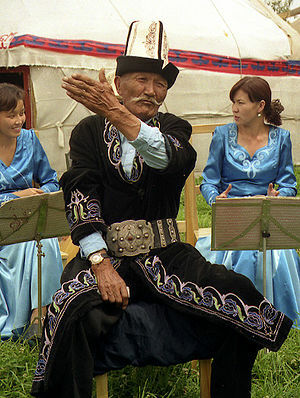 Sorry, sir, but that chapter does not as far as I can see use the phrase “oral traditions”, though it does speak of orality as a primary source — that is, it refers to genuinely oral communication as heard by the researcher in the here and now. The chapter thus refers to “oral reports”, “oral evidence”, “oral sources”, “oral communication”, “oral acts”, “oral witnessing”. HJ scholars do not have any evidence like this for Jesus. The early Christian evidence is all written and literary, not oral, and it is all secondary, not primary. If there had been any oral reports relaying the narratives of Christianity before the Gospels appeared they are all lost now and researchers must rely upon secondary written evidence alone. They may attempt to uncover what they believe are “oral traditions” behind that secondary written source but that is not the type of primary “oral source” that Howell and Prevenier (H&P) are discussing in chapter one. The only sources available are written and secondary. I have been attempting to engage a biblical scholar in a discussion on the theoretical underpinnings of how historians can know if an event or person in ancient times were truly historical or a mere fiction. The theoretical underpinning of the historicity or factness of the contents of any report, document or narrative is that those contents can at some level be independently corroborated. This is a truism we learned as children: don’t believe everything you hear. This theoretical principle operates in our legal systems, in our media reporting culture, in our research investigations, in our everyday lives. Let’s take a birth certificate as a case study. This contains information about the parents and birth time and place of a person, but also official seals or stamps and logos and names of the issuing authority in order to establish its authenticity. People who invented birth certificates recognized the need for independent corroboration of the contents contained in it, so they decided to add all this sort of information to it to make it more than just a blank piece of paper (that anyone could have written) saying so and so was born to x and y at this place here, etc. It is a sad thing to see scholars who are doctors and associate professors and holders of chairs demonstrate a complete muddleheadedness and inability to grasp the simplest of logical arguments when attempting to gainsay mythicist challenges to the historical Jesus paradigm.